A Room of One’s Own is an essay by Virginia Woolf based on two lectures she delivered in 1928 at Newnham College and Girton College, women’s constituent colleges at the University of Cambridge. 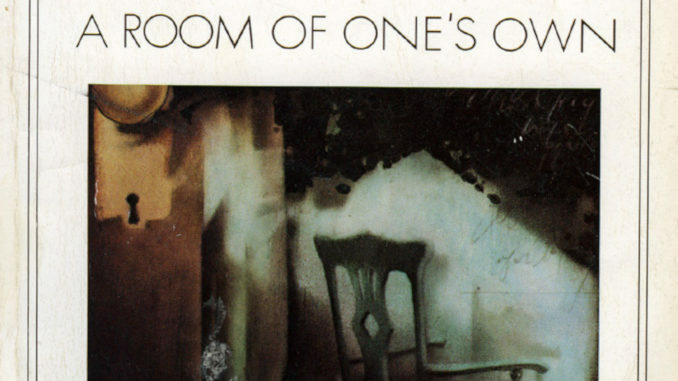 I read A Room of One’s Own when I was an English major in my first year of college and it has sat on my shelves ever since. During my transition from Washington, I sold thousands of books. The sales were generating cash flow and, consequently, the last few thousand books were stolen from my reseller’s storage bin. Another example of the fact that every penny is counted and considered important in our current economy. Somehow the Virgina Wolfe made it through in the small collection that was not sold or stolen. That is what decorates my little country home – the remnants. It was on a particularly beautiful sunny day several weeks ago. I was walking through to my back library. The house was full of the sounds of Bach. The smell of wonderful coffee filled the rooms. I reflected on how much I was enjoying this period in the early part of the year when I stay in Hickory Valley to focus on the Annual Wrap Up. I live in a remote location – it is a great place to enjoy “a room of one’s own.” And I do. As I reflected on the joy of this period, my eye caught the lavendar cover of the Virginia Woolf collection on my shelf. It occurred to me that I probably had not fully appreciated A Room of One’s Own when I first read it. So I took it down to read again. Woolf can get a bit long winded for me. However, there are more than a few lovely passages and many wise insights. I thoroughly enjoyed reading it again. Looking for something delicious for an afternoon read? Here it is!